Frank Sinatra was an American actor and pop singer. Bart answers the door to a man who has "a special delivery for Homer Simpson". Bart, expecting a package under Homer's name, says "that's me". The man punches Bart in the nose, remarking "don't write no more letters to Mr. Sinatra". 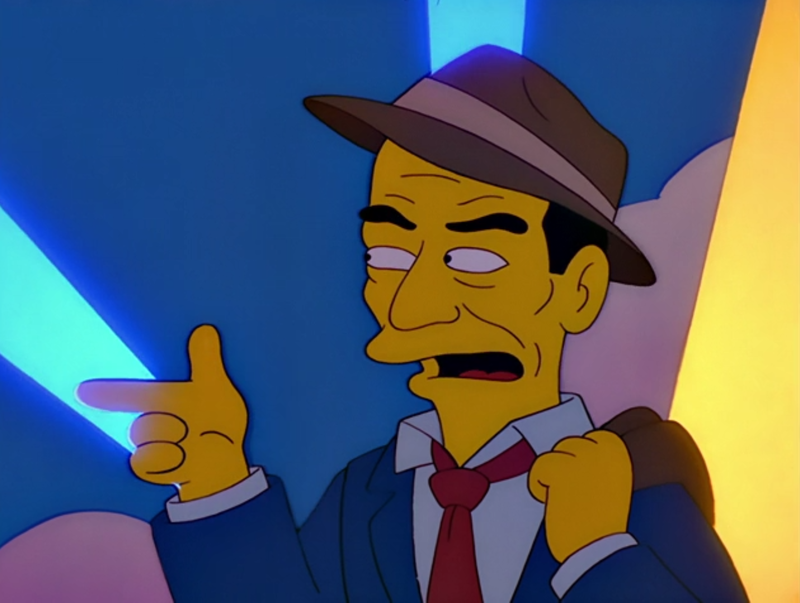 When Homer said that in showbiz, what goes up, must go down, Frank Sinatra was one of the names Bart and Lisa mentioned that flawed this, along with Bob Hope, Dean Martin and Tom Jones. When Disco Stu visited Praiseland to get a miracle from the statue of Maude Flanders, he had a vision of Heaven as a huge discothèque. Stu was surprised to see Sinatra there, but Sinatra told him, "For me, this is Hell. Ya dig, pally?" Luigi mentioned to Kent Brockman and Rachel Maddow that Mario's restaurant had a picture of Frank Sinatra signed by Frank Sinatra, Jr., but the frame covered the "Jr." part. Bart went past the album Sinatra Ruins Dylan by Frank Sinatra. One of the attractions at Family Guy World is "MacFarlane Sings Sinatra". Frank Sinatra was singing "Let it Snow" at Don Henley's Christmas party. "Summer Wind" (sung by Martin Prince, Jr.) is played at the end of "Bart of Darkness". "South of the Border" is played over the closing credits of "Kamp Krusty". However, the singer is not Sinatra, but a sound-a-like. "This Town" is played when Homer and Marge walk inside Springfield Mall in "Trust but Clarify". The heavy punching "Homer" for hassling Sinatra is a reference to his infamous alleged organized crime links. Episode – "I'm Goin' to Praiseland"
↑ "I'm Goin' to Praiseland"
↑ "Four Regrettings and a Funeral"
↑ "'Tis the 30th Season"
Modified on December 10, 2018, at 15:14.